The Space Between (Pauline Oliveros, Philip Gelb and Dana Reason) is proud to release the third CD in a trilogy of recordings with a world class bass player (Barre Phillips and Joelle Leandre are featured on the other releases). 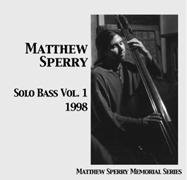 This CD is released as a tribute to honor our dear friend, Matt. The label, 482music is donating all profits from this CD to Matt’s family. The recording has not officially been released, but advance copies will be available at Thursday’s Benefit Concert. 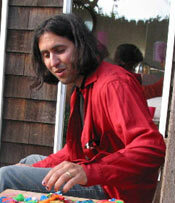 Interested listeners can also check out Philip Gelb’s recordings page. 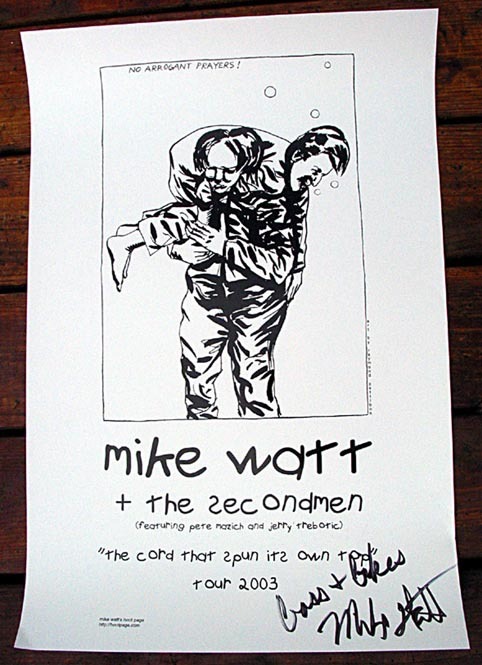 Maximum Wattage, a fan site following bassist Mike Watt, has a brief entry on Watt’s June 7, 2003 show in SF, the encore of which Watt dedicated to Matthew. Geoff and Evan have generously offered to burn a CD of the evening’s performance for anyone who is a fan of both Matthew Sperry and Mike Watt. To receive a copy, contact the webmaster at the Maximum Wattage web site. Myself and six other close friends of Matthew Sperry went to the Secondmen show at Bottom of the Hill last night, in Matthew’s honor. 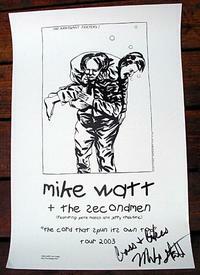 We’re all longtime minutemen/Watt fans, and figured Matthew would want us all to go see some good bass. Matthew came along – got in free. The show was motorbooty incredible, astral maritime kickass grinding fun. Watt just keeps outdoing himself, and the secondmen are… wow. On the way back to stage for encore, I grabbed Watt and told him quickly about Matthew Sperry’s death. Mike gave Matt props onstage and, in our minds, the whole encore was for Matthew. And it was amazing. Just what we all needed, to get out there and be carried away by great music and a great spiel, rather than sit around mourning. Watt signed a poster for us, “bass and bikes.” Right on. Watt, if you’re reading this, just wanted to say thanks for your music, and thanks for last night. It meant a lot to us.